The Smooth 9.45 TV treadmill isn’t just any old machine with a television stuck on the top. This is an extremely well-designed exercise unit and entertainment console. 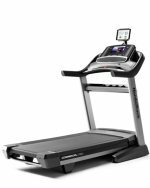 The Smooth 9.45 TV model is a health club level type of professional treadmill offered at a very affordable price for home use. The Smooth 9.45 TV treadmill offers a state-of-the-art hydra-suspension system, adjustable shock absorbing cushioning, and a 1" thick deck, to help keep you from jarring your joints. That means every user can adjust the softness of the running surface. This is a big deal when you consider that while running, your feet can strike the surface with a force of 3 to 6 times your body weight. Running on hard-surfaces such as concrete will shred your knees; running on the cushioned surface of the Smooth 9.45TV treadmill (with, of course, the proper shoes) will be a pleasure. UPDATE: The Smooth 9.45TV is an older model that is not being produced anymore. Check out our top picks under $1000 to find a comparable model. The company has acquired their solid reputation by building treadmills since the mid-eighties and turning their marketing effort to exclusive online sales since 2000. The Smooth 9.45 TV treadmill consistently rates high in virtually every category for appearance, durability, quality, and price, and the lifetime warranty on the motor, and 5 years on parts, gives you an idea of how well the company stands behind their product. You’re buying the Smooth 9.45 TV model because of the TV, which means that the electronics have got to be high end due to the vibration from the running deck. This is where Smooth goes one better: the TV console is mounted on a separate frame, so there’s no jiggling of the monitor. Why couldn’t other treadmill/TV manufactures think of that? We’ve yet to find any Smooth treadmill reviews which dog the machine based on the TV quality. The “entertainment” feature of the Smooth 9.45 TV is first-rate. 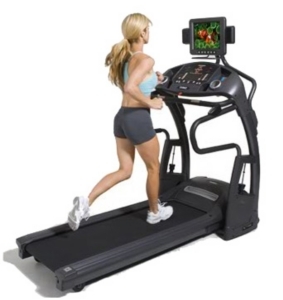 The Smooth 9.45 TV treadmill is priced $500 more than the 9.45 ST model, which is identical except for the television. If $500 seems like a lot to pay for the attached 15" TV, then you may want to go with the ST model instead.